A wise person once said that coffee tastes like hopes and dreams and god were he right! And what if I told you that there is an awesome place on earth where the coffee is brewed with happiness. Yes, that’s right. Paro town in Bhutan has all that a coffee lover can ask for. If you are traveling to Paro, you can tell from afar as the aroma of coffee fills the town. The town itself is quite unique. Today when the world is developing infrastructure with modern technology, this little town has maintained its originality by keeping the houses as it was hundreds of years ago. 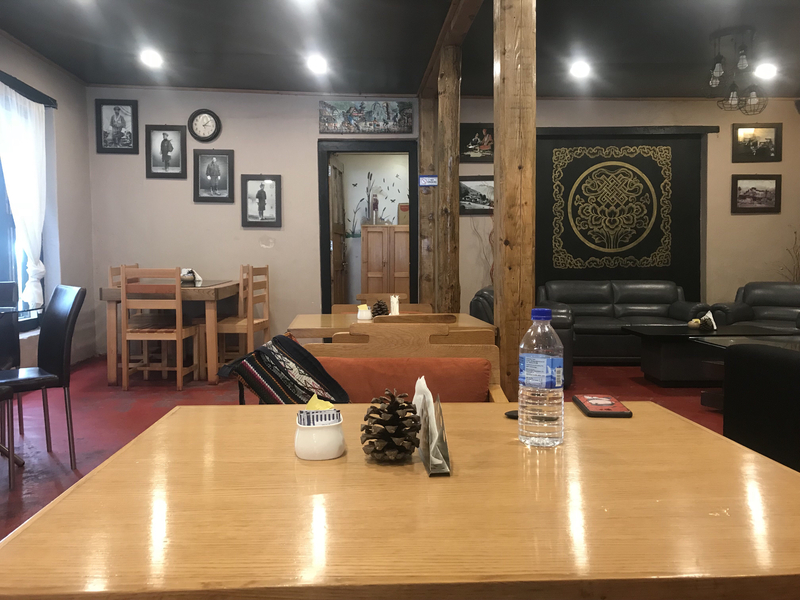 As a result, the Paro town is made up of traditional two-story Bhutanese houses with just the fronts revamped into cute coffee houses, restaurants or handicraft stores. Taking a sip of hot coffee by the window observing the Bhutanese way of life is an essential travel experience. 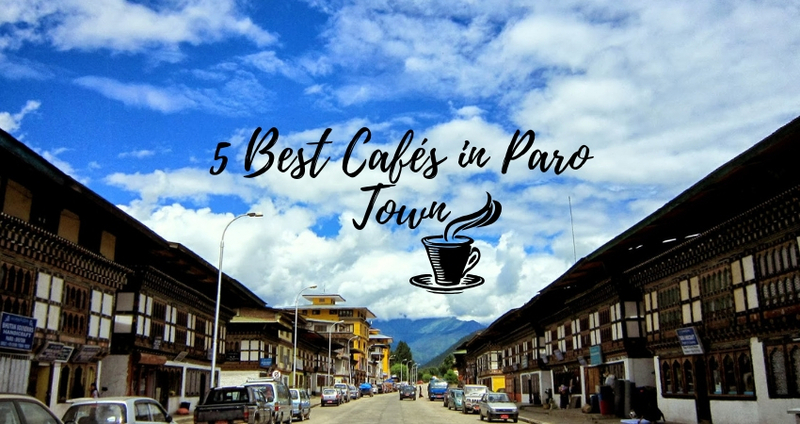 Check out our list of such 5 awesome cafés in Paro. Set in the heart of the town, this cafe is a paradise for dessert lovers. They have a wide variety of freshly baked patisseries, Pies, tarts, cookies, macaroons, croissants or cakes you name it, they have it all. They also serve freshly brewed coffee. Their interior radiates a nice feeling with their walls filled with black and white pictures from olden times. Since they do not serve meals, this place is perfect for a quick coffee break. 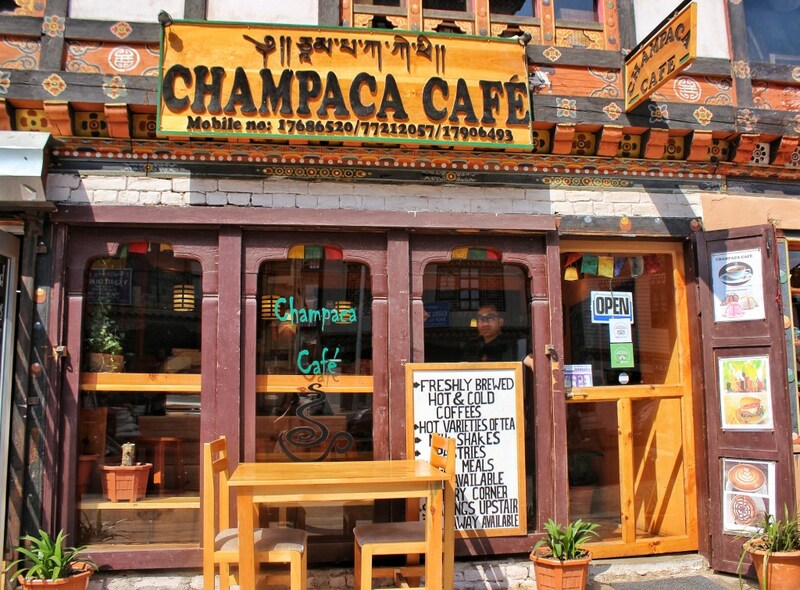 Located just next to Brioche Café, this café is one of the first to be opened in Paro. The café is really vast with seating areas both on the ground and first floor with comfortable furniture installed. And if you need a place to go for a first date, they also have a cozy private compartment which is perfect. Their huge menu boards on the ground floor just by the entrance offers a plethora of healthy meal sets, freshly baked goodies like pastries and cakes. They serve over a large variety of coffees like lattes, Americano, cappuccinos etc all freshly brewed. The free and uninterrupted Wi-Fi makes the places even more amazing. With quick and warm services, this café is one of the most popular cafés in Paro town. 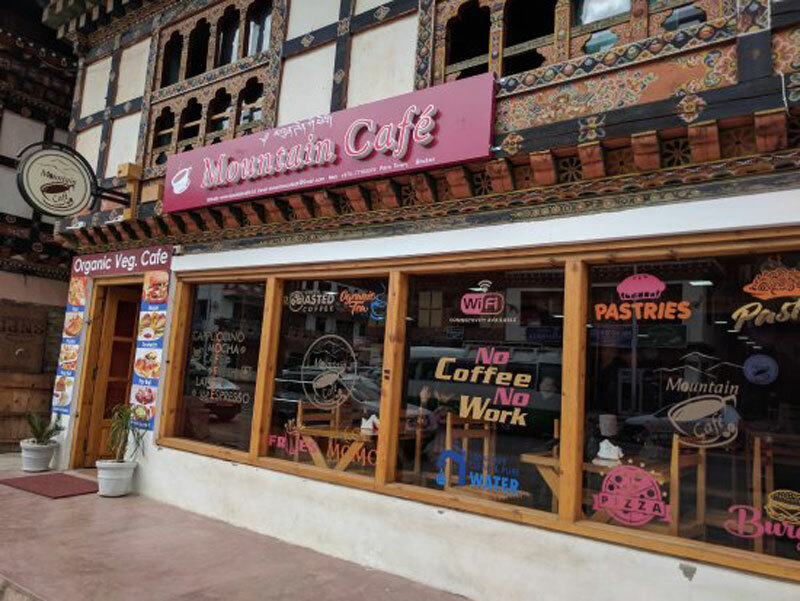 Mountain café is located right in the center of Paro town. With their massive red signboard, it is easy to spot. The café serves over a huge variety of food choices from Indian cuisine to continental and Bhutanese. The Pav Bhaji made with fresh buns and organic vegetable curry is hit among the Indian tourists. If you stop by Mountain café during lunch, I reckon you have some patience as the place gets really jam-packed during lunch with tourists and locals. Located right before you enter the Geptey farm road, the book café is a recent addition to the list of amazing cafés in Paro. 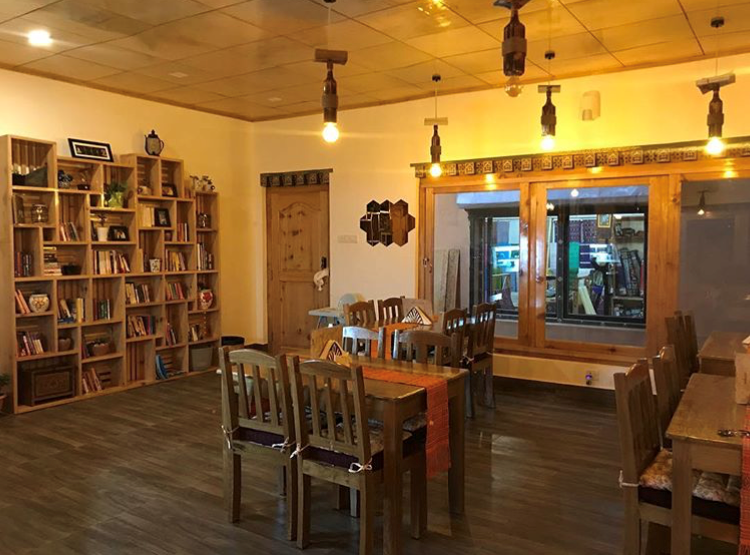 The book café is quite unique and probably first of its kind in Paro. The café is dedicated to the readers and the lovers of the books. Their interior is very minimal and to the point. A massive wooden shelf filled with books and show pieces is just beautiful and brings the whole place together. They believe in reading over a cup of freshly brewed coffee. They also serve very delicious food. If you are traveling to Paro and just need a coffee break with some good books, this is the place to go. Located in the heart of Paro town, this place is such a breath of fresh air. The place is on the first floor of a traditional Bhutanese house. A wooden stair welcomes the guests and leads them to a traditional balcony decorated with strings of dried red chilies and indoor plants. The balcony has bar sitting tools and tables for people who love being outside. The inside lounging area is quite cozy and the colossal Buddha face painting on their wall binds the whole place together. They serve a wide range of choices on food and their hoentey (buckwheat dumpling) is a personal favorite.